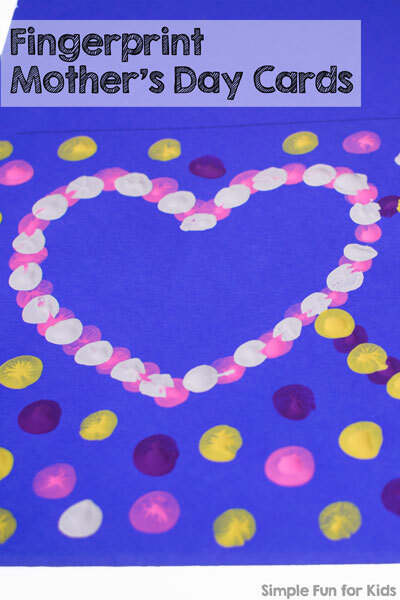 Are you looking for a quick and simple Mother’s Day craft? Check out the one I’ve written about on Fun Handprint Art Blog! To make it even easier, I have printable templates for these Fingerprint Mother’s Day Cards! Just print them on card stock and make fingerprints along the lines. The paint covers up the template, and you end up with a super cute card. There are three versions: double hearts, the word “MOM”, and three simple flowers. They all leave plenty of room to personalize the cards and add your own touch. Go over to Fun Handprint Art Blog right now and read all about them! Looking for Other Simple Crafts for Kids? Check Out These!